We met another FOTR (Family On The Road)! 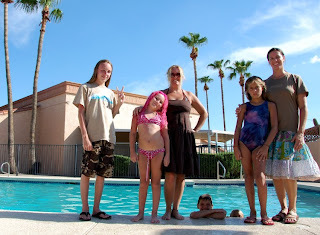 The Watkins family was in Mesa, Arizona so we went and spent the day sitting in and around the pool (seeing that it was always over 110° there)! It was great to finally meet Vicki, who I've followed online for probably 2 years now. She's a traveler, unschooler, hooper, and all around cool person. They're a long-time FOTR, we're talking like 13 years! They settled for a bit in Hawaii and I loved looking at her pictures. But now they're back in the lower 48 and I was so glad to finally meet them! I certainly hope we run into them again down the road.